In the late 90-ies of the last century when aerial photography in the Novosibirsk region researchers have discovered an unusual anomaly on the shore of lake chicha, which is 5 km from the town of Zdvinsk. In the picture you can clearly see the outlines of buildings, and on the area more than 12 hectares. Scientists are using geophysical equipment, explored a mysterious place called Chicabal. The photographs showed clear outlines of streets, neighborhoods, powerful fortifications, and on the edge – the remains of a developed metallurgical industry. Chicabal archaeological monument in Zdvinsk district of the Novosibirsk region on the shores of the Big lake, Cheech. Represents the remains of a large urban settlement area of more than 240 thousand m2 roughly IX—VII century BC, the period of transition from bronze to iron. Research by scientists of SB RAS. Archaeological excavations were preceded by geophysical exploration. Geophysical survey revealed that the area of the settlement surrounded with powerful defensive fortifications — ramparts and ditches. The settlement is divided into separate sectors, within which there are various houses and buildings, with each sector as the whole city had a clear the planned construction. Judging by the excavations carried out and found fragments of household utensils, in every sector, people lived almost European appearance, but different cultures. This gives reason to assume that Chicanery crossed the paths of different peoples. The first excavation in those areas was conducted in 1979 by the archaeologist by Vyacheslav Molodkinym, it was suggested the presence of an ancient settlement. Last year it worked the expedition of Institute of archeology Russian Academy of Sciences and the German archaeological Institute was conducted a geophysical survey of the territory and made a sensational statement-under a small layer of the earth is an ancient settlement, possibly proto 8-7 centuries BC In the picture were visible about 300 structures encircled by a defensive ditch and rampart, in the most fortified place, perhaps there was a noble part of this ancient settlement with more than thousand number of inhabitants. Archaeologists are convinced that the whole planigraphy presented by geophysical methods, coincide with the realities. Managed to contour the monument, which occupies about 20 hectares, 650 m long and 400 m wide (area equal to a medieval European city), on three sides it was surrounded by a moat and a low shaft, and the fourth he defended the steep Bank of the lake chicha. 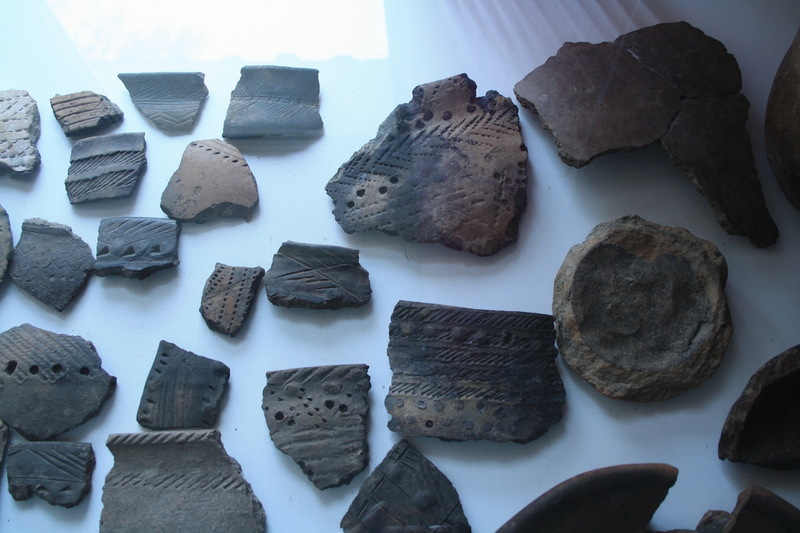 Numerous finds of ceramic vessels with ornament, some bronze knives, the attributes of harness confirm pre-Dating 8-7 centuries BC, pozdnerimskoe culture, the transition from the bronze age to the early iron age. Archaeologists worked on the 4 digs in different parts of the city. The rude tool that was used was a shovel, but mostly shovels, brushes. The top layer was disturbed by years of plowing. First excavated residential complexes was the pits 9×9 meters. It was huts, the walls and roof of which were constructed from wood. The materials used in the construction, wood, has not survived – it’s been 2800 years. The third excavation was fraught with mystery – ceramic items found there belonged to a different culture gumauskas characteristic region and the Urals. A lot of ceramic vessels found by archaeologists in this house, dozens of them appeared to be intact. While it is impossible definitely to say that it was for the room, perhaps trading post, where he came to exchange goods of different tribes. Perhaps there was a water trade route-the lake chicha, located near the Chany lakes, most likely is a continuation of the lake Chany. If you are lucky enough to find some fragments of boats, this hypothesis is confirmed. Could also be that these items were in a foreign culture as part of the dowry of the bride from the distant Urals, between the tribes if there was a connection that allows you to tie the marital relationship. 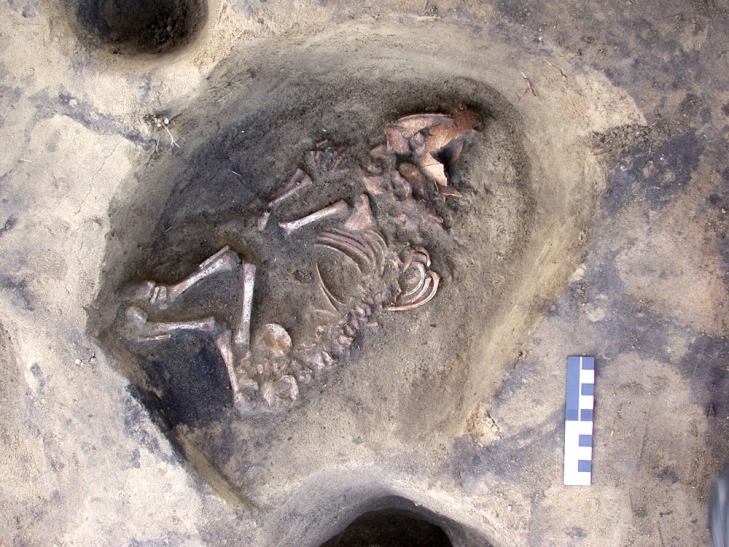 Excavation presented another surprise – finally, a grave was discovered – so far during excavations of monuments of culture pozdnerimskoe not found any burials. Archaeologists do not know how to have dealt with the dead compatriots, our ancestors: whether to use the ceremony of burning, air, or water burial. The woman from the burial, according to rough estimates, was about 60, the skeleton is well preserved, was able to take the material for genetic analysis, a few months later anthropologists and geneticists will be able to tell what race she belonged to. Judging by the fact that this burial was nothing but a few ceramic pots, the woman belonged to the noble class. In the excavation, located in the most fortified part of the settlement found numerous fragments of small figures, perhaps especially the broken. One of the intact figure resembles a lizard with a crest with pronounced male and female sexual characteristics. All this suggests the ritual nature of the clay sculpture. What can you say about living in the settlement? Most likely, they were engaged in hunting, the area was probably more forested, are found the scattered bones of forest animals – moose, bear, sable, beaver as well as Pets – horses, cattle, dogs. The dog was buried, a ritual existed usually hunters. Of the weapons found bone arrowheads, knives. However, the main lesson was no doubt breeding. In addition discovered bone tools resembling sickles, if this is true, then the population was engaged in agriculture, which will allow you to talk about the beginnings of civilization. In the 8-7 century BC in Europe was a process of transition from primitive-communal to class society. It is likely that the monument refers to the time when there was a transition from primitive society to the early class, that is, to the era of military democracy.